Mum and Ava are talking about birthdays. They write down Ava's age and double it. Then they add 5. The answer is 35. Mum says that is her age. What is the difference between Mum's age and Ava's age? What is the sum of their ages? 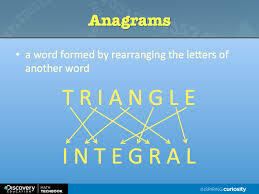 An anagram is a word or phrase whose letters can be re-arranged to make some other word or phrase. For example: triangle is an anagram of integral. Use the ten digits 0, 1, 2, 3, 4, 5, 6, 7, 8, 9 and use each digit once and once only. Divide the ten digits into two groups of five, and then arrange the digits in each group of five to make a multiplication sum.